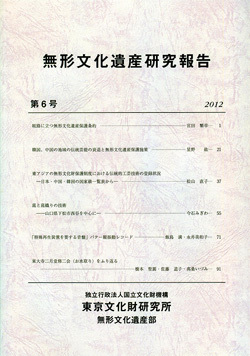 Volume 6 of ‘Research and Reports on Intangible Cultural Heritage’ was published in March 2012. This volume includes not only research and reports relating to intangible cultural heritage, but also the transcriptions of the public scholarship lecture, “Records of the Shuni-e Ritual (Omizu-tori) at Todaiji Temple,” held on October 22, 2011 sponsored by the Department of Intangible Cultural Heritage, as well as the planned discussion between Mr. HASHIMOTO Shoen, Choro (the head monk) of Todaiji Temple, and Ms. SATO Michiko, an emeritus researcher at the Institute. The topics covered in this discussion would be very interesting not only for the participants who were at the lecture, but also for anyone who is interested in the Shuni-e Ritual at Todaiji or in Japanese traditional events and performing arts. As with the previous volumes, the PDF version of all pages will be made public on our website.